MusicTrans for Desktop will run on your favorite operating system using the full power of your personal computer. Although this is almost identical to the Android version, there is no need to transfer your music library to your mobile device in order to work on your songs. And because you have a bigger screen, there is an additional upper octave in the note analyzer. 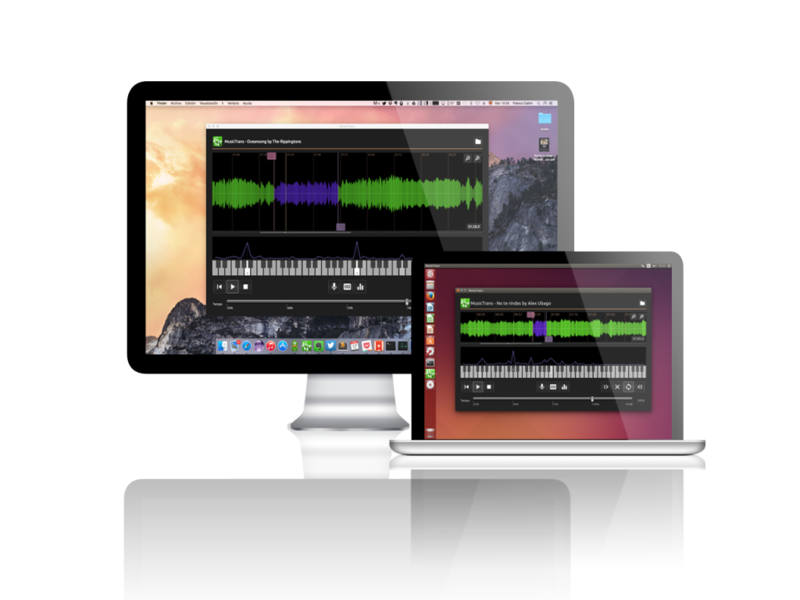 MusicTrans will work on Windows, Linux and Mac OS X, 32 or 64 bit. MusicTrans for Desktop is distributed as a demo version that will run for a few minutes before going to silence. You can close it and start again as many times as you want. If you want to get unrestricted access to MusicTrans and support its development, we invite you to buy a License using any of the buttons below. After we receive the payment notification from the payment gateway, we will create a license for your registered email address on payment. A key code for your license will be sent to that email address. Take into account that payments with Chilean Pesos are not yet an automated process, so it may take some time on our side to process the payment notification. However, you can always contact us on fcatrin at gmail dot com if you have any questions about your license (or MusicTrans in general). You need only one license to run MusicTrans on any of the supported desktop operating systems. You can run MusicTrans with a limit of 6 computers per license. If you add a 7th computer, the first one will be deactivated (you can reactivate it at any time). We hope that you enjoy MusicTrans as much as we do!